While it may not be palatial, this sweet three-bedroom, two-story (plus finished basement) townhouse at 455 37th Street in Sunset Park on a lovely street of tidy 1900s row houses would make a terrific “condo alternative.” Sunset Park, which the listing reminds us was recently dubbed the nation’s number one “edgy cool” neighborhood, is indeed a rising star. With exciting projects in the works at Industry City, an amazingly diverse mix of residents, proximity to transportation, parks and the waterfront and even a recent turn as the winter home of the Brooklyn Flea, Sunset Park is one of those places you might wish you’d moved to years ago. But there are still deals to be had among the just-as-diverse housing choices, like this well-preserved home asking $1.405 million. 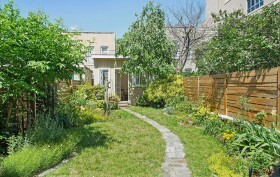 And a magical back yard with an utterly charming garden studio are definitely something you won’t find in most condos.